Does this look like a ghost town to you? 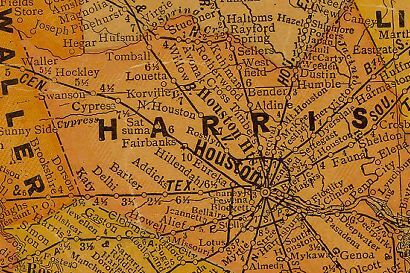 While most communities fight annexation, the residents here actually asked Houston to include them (as an election ward) after they were left stranded by a hurricane in the early days of the 20th century. 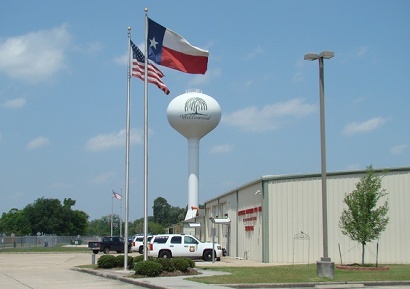 It was first known as Tomball to honor the man the present city of Tomball is named after. When a rival railroad named their station Tomball in 1907, the town then took the name of Scoville (orign unknown). A post office opened under that name in for about one year � starting in 1908. In 1910 the post office was replaced by the North Houston post office (which closed in 1928). Mail was thereafter rerouted through Fairbanks. If these are ghost towns, why are there so many people here? Although they now only exist as sign names at large intersections (Barker-Cypress, Bammel-North Houston, Aldine-Bender, Alief-Clodine, et. al.). It may surprise non-natives that all of these names once represented once struggling or proudly self-sufficient towns. Even the inside-the-loop street of Crosstimbers was once a separate town. While most people associate ghost towns with ruins and desolation - these ghosts live among us. Were aisles seven and eight at your local HEB once a syrup mill? Was Radio Shack once a livery stable? Best Buy a cornfield or cotton gin? Are there unmarked graves under the floor of your favorite Mexican restaurant? The short answer is this: In many cases these villages were already ghost towns - or so close to being ghost towns that you could hardly tell the difference. Most had their life-blood drained from them after WWII with the migration of rural families to Houston. The phenomenon was statewide. Dallas and Ft. Worth have their fair share of postwar "absorbed" ghost towns - as do smaller cities. Then "Edge City" happened. The relentless march of strip centers, subdivisions and gated communities overtook these former towns until only the names and cemeteries remained. While the subject is worthy of further investigation (exactly where is the Lily White cemetery behind Memorial City Shopping Center? ), we're happy to include this topic, made possible by generous grant of time, sweat and reseach by the Team Rudine.